After Samsung has come up with its greatest Smartphone Ever and has Captioned it as ‘Designed for Humans’. Now it has come up with the next great Gadget that is the Samsun Galaxy Note II which is presently put for Pre-Booking. 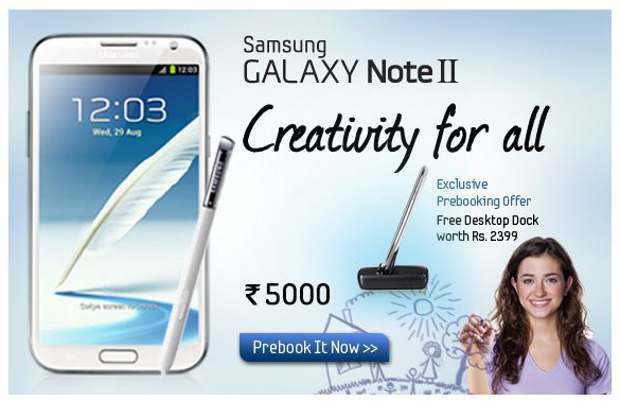 And along with it Samsung has put an Exclusive Pre-Booking Offer i.e. If you Pre-Book now itself you will be getting a Desktop Dock worth Rs. 2399 for free with every pre-booking. And an advance of Rs. 5000 is to be paid for Pre-Booking. Galaxy Note 2 is available in 2 Colours : White & Gray!